We are living at the pinnacle of psychiatric discovery and innovation, a time in which the landscape of pharmacological therapy is broader than ever and biological psychiatry is opening up new frontiers in mental health treatment. We are harnessing the power of technology to integrate therapies in new and revolutionary ways and disseminating cutting-edge research to popular audiences in a way never before possible. And, yet, even in this time of extraordinary progress, many people living with depression, anxiety and stress are finding relief in an ancient practice, something that many of us have already done in one form or another, even if only in grade school: pottery. As you know, we’re focusing on apps, thus we have discovered an extraordinary app for users to express their pottery skills – ReallyMake. ReallyMake lets both Android and iOS users create their own pottery, to paint and mold for hours, to relax and have fun. Just use your smartphone or tablet and take your creations all the way from virtual reality to your doorstep. Whether you want to express your creativity or to relax from the daily stress you’re experiencing, ReallyMake has got you covered. This app lets you virtually create pottery and ceramic art, by only using your mobile phone or tablet. 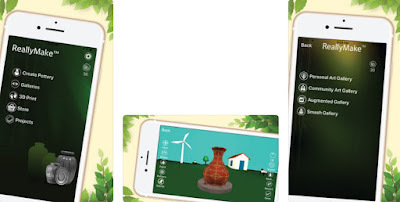 Create your own custom pottery with the app’s tools and build a gallery of your own. Mold clay, paint, choose patterns, use stamps and customize your piece the way you like. Save finished ceramic pottery pieces in your art gallery and make them visible to the app’s community. You can also share your artwork with friends and family on any social network you’re using. Use Augmented Reality (AR) to project your pottery on your table or floor to see what it looks like in the real world, and even choose to have it 3D printed by real artists. With these awesome features, and many more, the ReallyMake app is available for download on Amazon, Google Play, and on the App Store. It’s free, with some in-app purchases.